Speaking of barbecues, they can become parties that exclude the non-animal eating community. My vegetarian husband lucked out finding Field Roast, a Seattle company that makes vegan grain meat, after numerous attempts with other meat alternatives that were ... just gross. Even being an animal eater myself, Field Roast sausages are a staple for me. We dress our dogs with cream cheese and grilled onions, especially with the Mexican Chipotle flavor I show below. Serve this with the potato salad at your next bbq, open a cold brewski, and bask in the sun with me as our transparent skin tries to avoid getting burned. Peel and cut the potatoes into bite sized pieces, about half an inch. Take a quarter of the pieces and rough chop them even smaller. 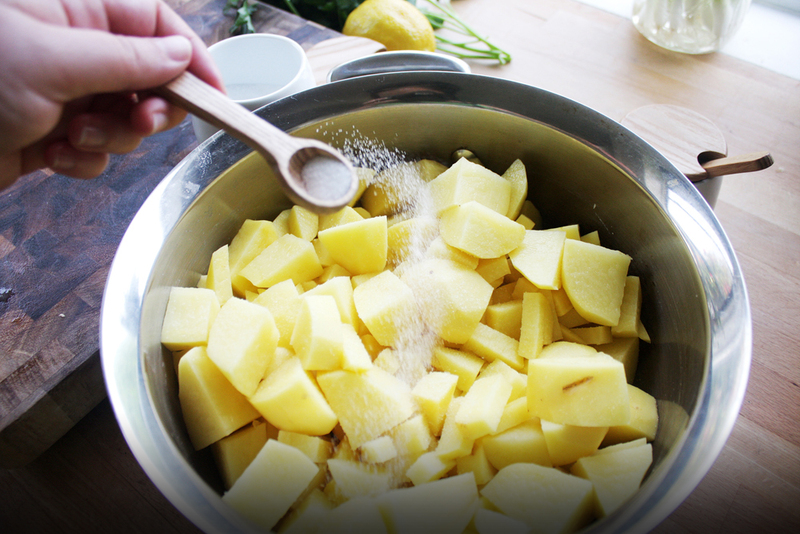 Add a large pinch of salt to the potatoes in a pot, then boil for 25 minutes. Drain, leaving ¼ cup of liquid, then set aside in a large mixing bowl to cool. Quarter the cucumbers lengthwise, then dice into small pieces. 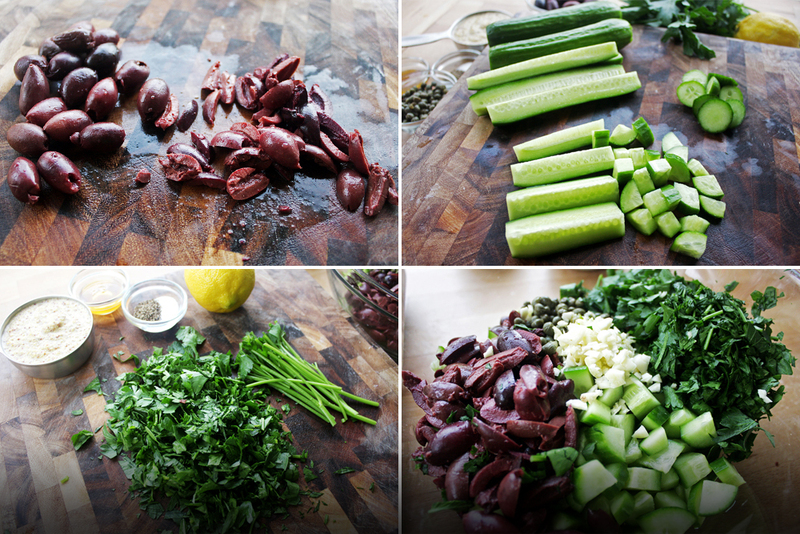 Rough chop the pitted kalamata olives and parsley. Finely mince the garlic. 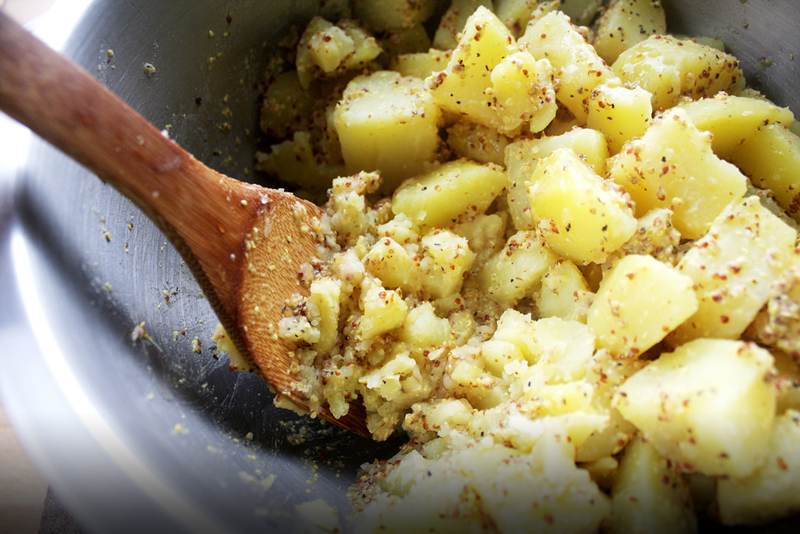 Add the mustard, honey, salt and pepper to the potatoes. 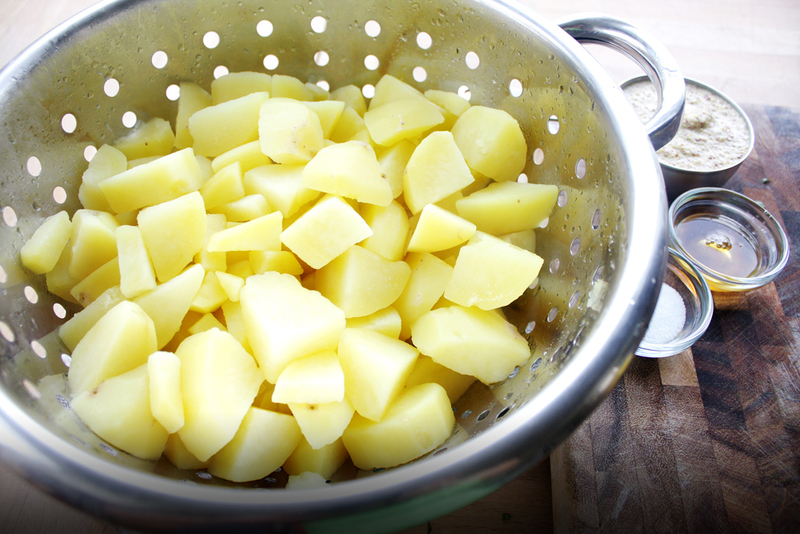 Stir until evenly incorporated, then mash about a quarter of the potatoes in the bowl to create a creamy texture. 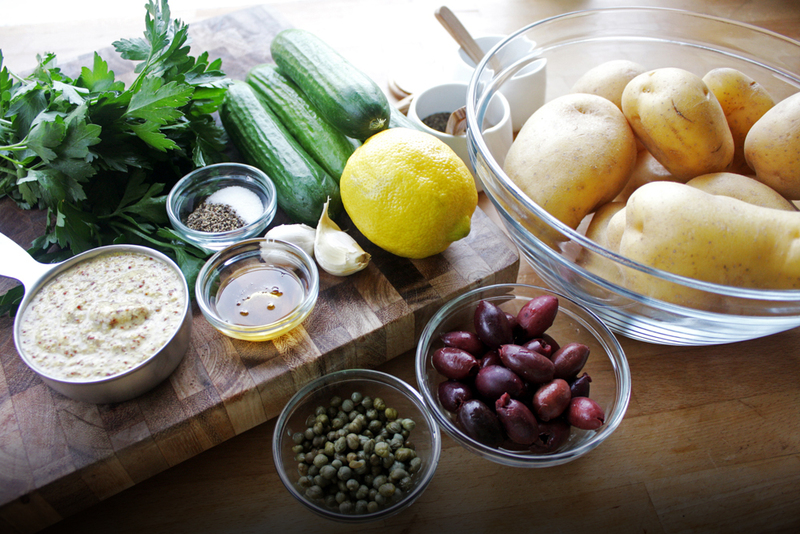 Combine the cucumbers, olives, parsley, garlic, capers, lemon zest and juice to the potatoes. Thoroughly mix, making the potato salad even creamier, then taste and add salt and pepper if necessary. Serve cool as a side dish. When my husband told me that one of his favorite foods was cole slaw, it was almost a deal breaker. All I could hear out of his mouth was mayonnaise mayonnaise-mayo-mayo-mayo. So when something is just a tad too creamy for me, I like to add some sharp flavors like lemon and green apple to balance it out. Now, this dish has become a staple and we are no longer a house divided ... on cole slaw. We are still split on the issue of how many times a person really has to see The Godfather in one's lifetime.